So it’s that time of the year again….leaves are changing colors….pumpkin everything is abound….and time for Greenbuild 2014! This is my third Greenbuild, with Toronto -2012 & Flipadelphia – 2013 (go Mets!) 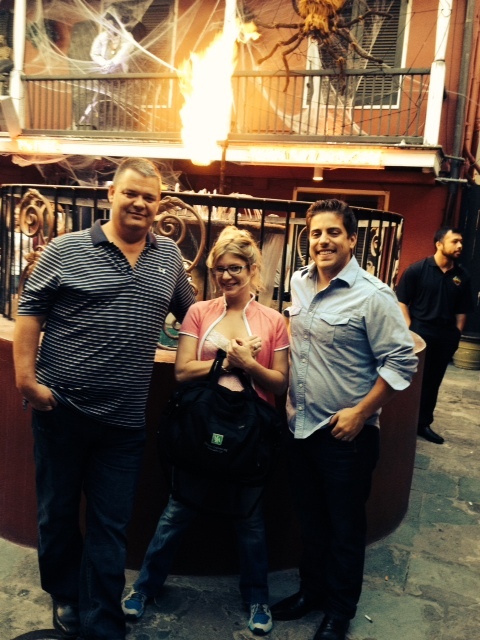 being my predecessors, so we were going into New Orleans – 2014 with a good idea of what to expect and how to “attack” the conference. For those of you not familiar with Greenbuild, it is the premier conference for sustainable building, drawing manufacturers, engineers, architects, students, politicians, etc. The expo center boasts approximately 500+ exhibitors with 35,000 people attending over the course of the expo; so it is a great opportunity to check out new technologies and find out who is doing what in our microcosmic building design/operations industry. Additionally, there are three days of educational sessions, ranging from net-zero buildings to NYC Local Law requirements. And this is where some of the best value from this conference comes in. Regardless of where this conference is held, many of the leaders of our nation’s greatest cities are present to evaluate what their peers are doing and to share the new initiatives they themselves are propagating. This year, we had the opportunity to sit in a very informative lecture concerning NYC’s Local Law 87 (LL87) and changes to the NYC building technical requirement (TR1/8) inspections, with NYC’s department of buildings Chief Sustainability Officer and inspection counterparts. I had an amazing opportunity, in a peer forum, to find out what direction our clients are headed and to network afterwards in regards to how HEA can help push the envelope of the NYC department of buildings. Each year at this conference, it becomes evident that despite how big our nation is, our industry is a small world. This becomes apparent after seeing the same faces representing their organizations and the same vendors with whom we have developed relationships. A ten minute conversation with our IAQ sampling laboratory results in a realization of how we can further support each other in our mutually beneficial relationship to start bidding on larger IAQ projects. We also stepped into a lecture with one of our contacts from Google’s sustainability team from Mountainview California, which was a great opportunity to talk for five minutes, face-to-face, on the goals and vision for the project, rather than the weekly conference calls. As always, it was great to catch up with Liz Fischer at the Building Commissioning Association (BCA) , to discuss where the professional organization sees the industry heading towards and how different regions are reacting differently to building commissioning as a whole. An hour into the conversation, we determined that there is an upcoming election for an open board position with the BCA, which HEA has since applied for to continue our strong relationship with the BCA. Supporting the BCA and their efforts is important to HEA, as they have helped us shape the organization we are today. One of the most interesting conversations we had all week was on urinals…..yes…Urinals! After trying to find who had the tickets for the best afterparty….I mean networking event….we ended up at the massive Sloan booth. Decked out with high end faucets, toilets, flushometers, water features and a new type of waterless urinal. 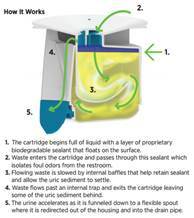 Old waterless urinals designs involve a replaceable cartridge, which acts as a plumbing trap to maintain the gravity trap and “eliminate” odors. For all the ladies who haven’t had the luxury of seeing the operation of a waterless urinal, no worries you aren't missing much, as the odor elimination is minimal and results in a poorly maintained piece of toilet equipment. One of the main problems with these systems, is that due to the lack of water flow, sediment grows in the pipes. Normally, a high pressure flushing of the lines to break up and remove the sediment occurs, which can negate water and financial benefits of this system type. Now, Sloan has introduced a new “waterless” urinal, with a similar trap system (very similar to a steam trap at first glance), which includes a one-gallon per week flush-o-meter (52 gallons per year), aimed to reduce the sediment build up, reduce lingering odors and help maintain the lifecycle of the trap. This conversation went from a quick self-preservation of “hey I heard you have the tickets to the afterparty”, to one of the most interesting and longest conversations I've had about urinals to date! Did you catch that I said one of the most and not THE most interesting urinal conversation I've ever had. Engineers like talking about urinals what can I say…. Not every interaction results in a “win” situation, but getting these clients and vendors outside of their daily operations and into a person-to-person interaction allows everyone to lower their guard and figure out how we can help each other – because one organization cannot do it all. One of my biggest takeaways from the 2014 conference, and for all conferences, is sometimes it is best not to go in with expectations of what you need to accomplish or whom you are going to network with, but instead just start talking to people and see where it takes you.